Can’t You Hear the Whistle Blowing on Exchange Street? Exchange Street has been an important street in Buffalo since the early days of settlement. Exchange Street runs approximately 1.75 miles from Main Street in Downtown to Selkirk Street, near the Larkin District of the East Side of Buffalo. Exchange Street was one of the first streets in Buffalo, originally a pathway that was traveled by Red Jacket and other members of the Seneca Nation as they came into Buffalo from the Buffalo Creek reservation. Joseph Ellicott incorporated the path when he laid out the original street plan for Buffalo. The street was originally named Crow Street. Exchange Street was particularly important during the railroad era of Buffalo’s history. John Crow arrived in Buffalo around 1801 or 1802, coming from Whitestone in Oneida County, New York. Mr. Crow occupied a house on Inner Lot No. 1, the southwest corner of Washington and Crow Streets. The log house had been built by Mr. Johnston, an Indian agent and interpreter who served for the British government and remained here until the Holland Land Company arrived. Mr. Johnston had received land from the Native Americans in exchange for providing them with boards and planks from the timber on his land. Legally, Mr. Johnston’s land hold was not binding. In negotiations with the Holland Land Company, Mr. Johnston gave up a portion of his land in exchange for keeping a portion along Buffalo Creek where he had his lumber mill separate from the Buffalo Creek Reservation. Mr. Crow built an addition to the house with a tavern. When Erastus Granger arrived in Buffalo to serve as postmaster, he set up shop in Mr. Crow’s tavern. The tavern was also the first place of lodging for Samuel Pratt when he arrived in Buffalo. You can visit a replica of the Crow Tavern and Mr. Granger’s post office in the Pioneer Gallery at the Buffalo History Museum. At the time, Exchange Street only ran from Main to Washington, as no streets at the time had been laid out beyond those early streets. 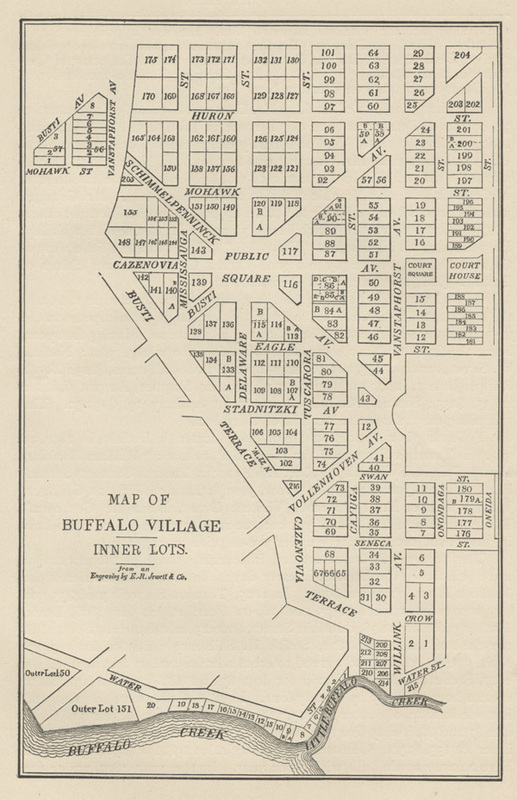 In 1806, Buffalo had 16 houses (8 on Main Street, 3 on the Terrace, 3 on Seneca Street, and 2 on Cayuga-now Pearl Street), two stores – a contractor’s store and a drug store, two taverns, and two blacksmiths. Mr. Crow stayed in Buffalo until 1806, when he moved to Hamburg and later Pennsylvania. Mr. Crow died in Waterford, PA in 1830. In 1809, Crow’s Tavern became Landon’s, which burned down in 1813 during the Burning of Buffalo. It was rebuilt by Mr. Landon after the war, and was operated by him until 1824. 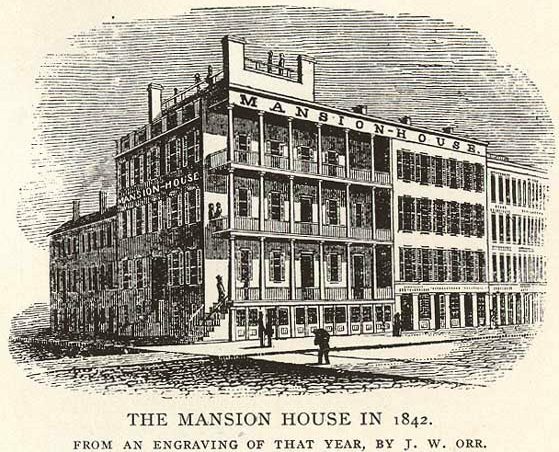 In 1825, Phineas Baron took over and renamed it the Mansion House. Mansion House was in business until 1929! The street was named Crow until many “gentleman” of the city felt that Crow was a vulgar name, since crows were considered to be vulgar, dirty birds, so the street was changed to Exchange Street in 1836. By 1839, there were several unsuccessful petitions to try to change the name back to Crow. Many train stations were located along the Exchange Street corridor as early as the 1850s. The New York Central Exchange Street Terminal was built in 1870, with expansions in 1885, 1900, 1901, 1906 and 1907. The station was the starting point from where most people entering the City of Buffalo. For 58 years, the station was the arrival point of most people coming to Buffalo. Exchange Street was the first thing most people saw when they arrived. 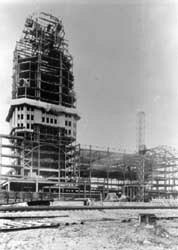 In 1929, New York Central transferred its base of operations to the Curtiss Street Terminal (what we refer to today as Central Terminal) in the Broadway-Fillmore neighborhood of Buffalo. They all closed their doors after the new terminal was built. The Exchange Street station was still used by some commuters but they did not provide the neighborhood with enough spending to support businesses, as they rushed from their train to their office for work. The majority of the station was boarded up and only the western entrance was open. The station restaurant and newsstand closed, and only one door was opened for coming and going. Only two ticket windows remained open. The offices over the station closed because most of the personnel went to Curtiss Street. Before the station closed, the Exchange Street corridor was one of the most important thoroughfares. The street was busy with manufacturing, railroad terminals, hotels, and stores. The Courier-Express said of the street’s heyday, “Exchange Street took off its hat to none of its rivals.” There were shops for souvenirs and postcards, neighborhood restaurants and lunch counters, and cafes. Trains arrived at all times of the day and night, so there was a constant flurry of mail trucks, express trucks, delivery vehicles, and people. One hundred trains a day stopped at the old station. A story goes that while Grover Cleveland was President, he was on a train heading to a funeral and a friend was staying at the European Hotel at the northwest corner of Washington and Exchange. President Cleveland asked the train to stop so he could visit with his friend. The hotel was then renamed the Washington Hotel in order to capitalize on its presidential connection. The Exchange Street depot was the starting point of the Buffalo Belt Line railroad in 1883, which circled the city and allowed development of the City of Buffalo outside of the downtown core. Once the NY Central train station closed, Exchange Street was left “looking something like Goldsmith’s deserted village.” The popular Mansion House hotel, with its roots stretching back to Crow’s original tavern, closed after the train station left. Between Michigan Avenue and Main Street, there had been a dozen barber shops which all closed. In addition to the NY Central station, there was also the Erie Station at Michigan and Exchange Street, and the Lehigh Valley Station was nearby on Washington Street. In 1935, the NY Central Exchange Street Depot was torn down. Also that year, the Erie Railroad Station was abandoned, when they moved their facilities into the DL&W Terminal on the Waterfront. This was considered by some to be the end of Exchange Street as a bustling corridor. The Lehigh Valley station and the right-of-way was purchased in 1954 by New York State to build the Niagara Section of the New York State Thruway. In 1955, the Buffalo News purchased some of the surplus lands from the State to build their current building (1 News Plaza). 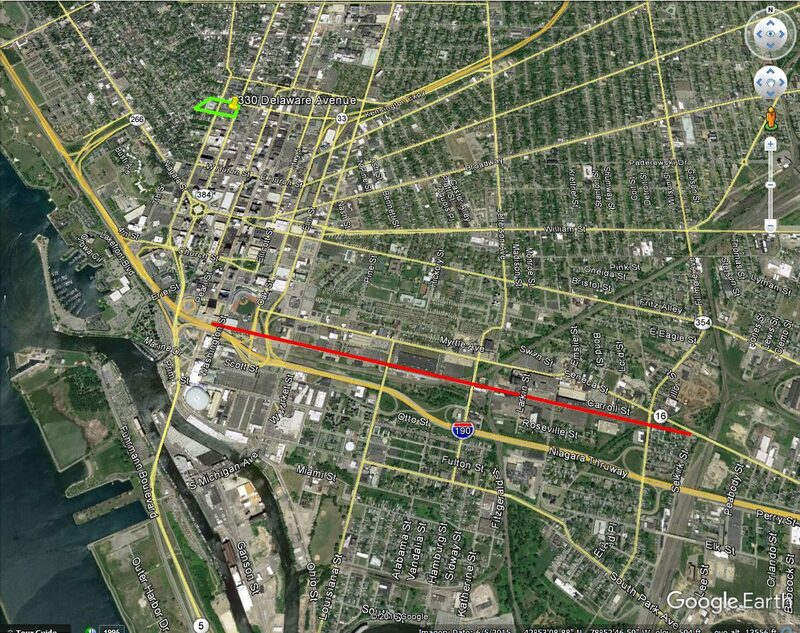 The Thruway was built through this section of Downtown Buffalo and opened in 1960. The six-mile-long Downtown Buffalo part of the Niagara Section was the last portion to be completed of the 559 miles of the New York State Thruway System. The Exchange Street Terminal continues to serve trains today. A new, significantly smaller Exchange Street station was built on Exchange Street in 1952. This station served 21 trains a day and the station used two platforms that were connected via a walkway. Passenger railroad traffic continued to decline and the station closed in 1962 when service to Niagara Falls was suspended. Buffalo Central Terminal closed on October 28, 1979 and Amtrak service switched that morning back to Exchange Street where a new station was being built, which opened in 1980. The Amtrak station currently serves eight trains a day at Exchange Street. For more than 150 years, railroads were a huge part of the life of the Exchange Street corridor. There is current talk (2016) about building a new train station in Buffalo. The One Seneca Tower, with its one million square feet of vacant commercial space, sits ready for redevelopment at the end of Exchange Street at Main Street. At the other end of Exchange Street, recent developments in the Larkin District are rejuvenating that area. What’s next for Exchange Street? It’s yet to be seen. What would you like to see there? To learn about other streets, check out the Street Index! Ketchum, William. An Authentic and Comprehensive History of Buffalo, Vol. II.Rockwell, Baker & Hill, Printers, Buffalo NY, 1865. “Old Railroad Station Once City’s Busiest Spot”. Buffalo Times, October 25, 1931.